Vinyl just sounds better…or so I hear. I can hardly find my music on my phone without the added stress of record needles and multiple speed options. 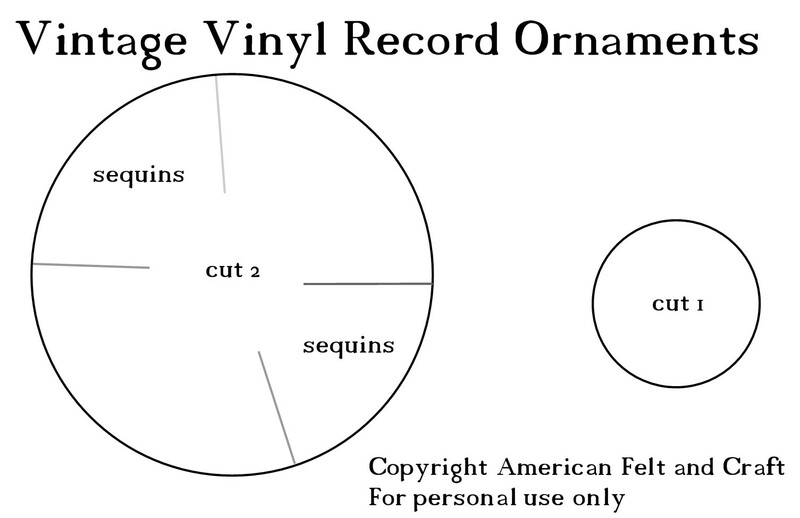 Bring the joy of vintage vinyl to this year’s tree with these easy felt Christmas ornaments. Cut out 6 large circles from black felt and 1 each of smaller circle from Poppy, Cilantro, and White felt. Attach Crystal colored sequin to the center of the smaller circle. Place the smaller circle onto the larger on and glue or sew into place using an overcast or running stitch and matching thread. Attach Silver Streak sequins to both sides of 1 of the black circles as marked on the template using felt glue or matching thread. Loop ribbon over and attach to undecorated felt circle. Overcast stitch both record pieces together. Sit back and jam out the sweet sweet sounds of a completed felt ornament. Repeat with remaining felt pieces and colors. Tune in tomorrow for pics of the completed Hipster Tree...you know you want to! Stop by our store and visit with our hundreds of felt colors. Ok, I simply LOVE this project, but I’ve read thru it 3 times and I’m NOT SEEING the template???? Want to make these, please help!!!! Hello, It looks like it had a little trouble uploading but it should be there now.